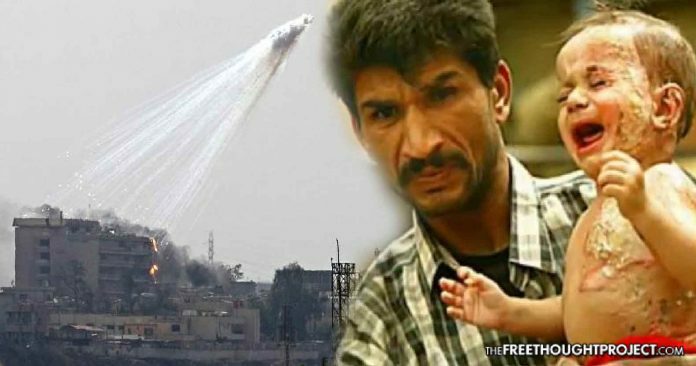 Earlier this month, multiple reports surfaced of US-led coalition forces in Mosul, Iraq and Raqqa, Syria, using the incendiary chemical weapon, white phosphorus, on civilians. For over a week, the US government and the coalition at large have remained silent on the issue — until now. In an error that will likely get him much backlash, in an interview with NPR, New Zealand Brig. Gen. Hugh McAslan, and member of the US-coalition has admitted — for the first time — to using white phosphorus during operations in the Iraqi city of Mosul. “We have utilized white phosphorous to screen areas within West Mosul to get civilians out safely,” McAslan told NPR on Tuesday. Instead of questioning the horrid nature of the chemical weapons use on civilians, NPR echoed the general’s sentiment and noted that 28,000 civilians have managed to escape. While that may be true, countless others were injured or suffered horrifying deaths. While deploying incendiary weapons against residential areas is banned under Protocol III of the Convention on Conventional Weapons (CCW), the two other uses — smoke screens and signals — are not, which allows the hypocritical US, to keep such munitions in their arsenal and use them. It is through this loophole that the US claims the right to deploy these deadly weapons on towns. On November 30, 2005, General Peter Pace stated that white phosphorus munitions were a “legitimate tool of the military” used to illuminate targets and create smokescreens, saying “It is not a chemical weapon. It is an incendiary.” However, the general is wrong. As soon as white phosphorus is deployed against people, it becomes a chemical weapon. White phosphorus remains very dangerous even when not deliberately used to start fires or attack humans. Submunitions can ignite days after deployment and remain a hazard for a city. Injuries caused by the chemical can burn to the bone and are prone to reigniting if a piece of the phosphorus remaining in the wound is exposed to air when a dressing is changed. “No matter how white phosphorus is used, it poses a high risk of horrific and long-lasting harm in crowded cities like Raqqa and Mosul and any other areas with concentrations of civilians,” said Steve Goose, arms director at Human Rights Watch. The US claims of using white phosphorus as a smoke screen or signal ring hollow when assessing the damage reported on the ground in Syria and Iraq. Just as the rights groups warned, civilian casualties were, in fact, a reality from the coalition’s deployment of white phosphorus. Xinhua News, China’s state press agency, reported last week that “Tens of civilians were killed on Thursday when the U.S.-led airstrikes targeted Syria’s northern city of Raqqa with white phosphorus,” citing a report from Syria’s Sham FM radio. Russia’s Riafan.ru reported that “Coalition forces led by the United States of America shell Raqqa and suburbs of white phosphorus munitions,” citing reports on Twitter, which said the U.S.-backed coalition conducted 20 air raids. Although the total number of civilian deaths has not been entirely confirmed, early reports suggest that nearly 50 people were killed. “Horrific civilian harm from previous use of white phosphorus has generated public outrage and this latest use of white phosphorus underscores the urgent need for states to strengthen international law relating to incendiary weapons,” HRW’s Goose said. Although NPR happened to have the general admit to them US forces are using white phosphorus, no other mainstream outlet in America has picked up this bombshell story. Their silence shows their complicit nature in covering up the alleged war crimes of the West. “US-led forces should take all feasible precautions to minimize civilian harm when using white phosphorus in Iraq and Syria,” Goose said of the situation. However, from the reports on the ground, that appears not to be the case. In the video below, the US-led coalition is dropping white phosphorus bombs on Western Mosul. Watch for yourself and decide whether or not it was being used as a ‘tool’ to allow civilians to escape.